As you drive up Greenhorn Ranch Road, your cell signal slowly disappears and the notifications that represent the pressures of daily life cease for a while. It looks like it is time to disconnect to reconnect with your family and friends and make some memories! 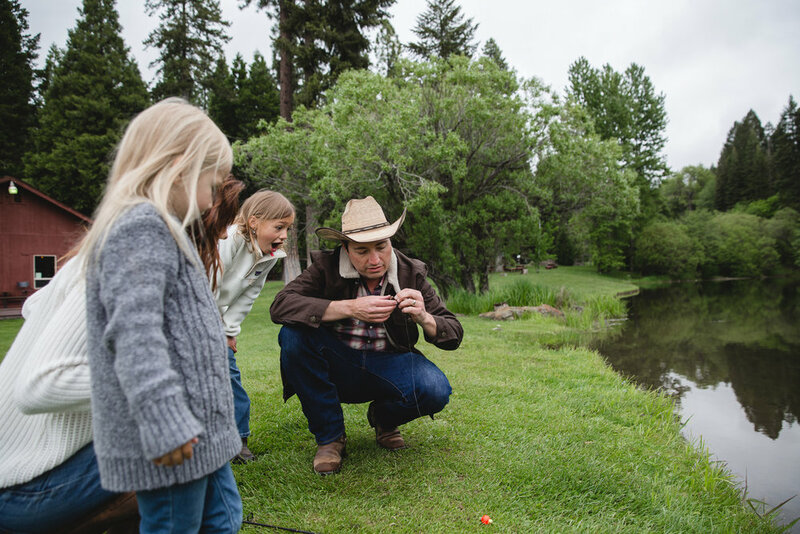 We all know that the best life is the life happening right in front of you (and we don’t mean on the screen), so leave your iPhone in the car and come experience the countless activities and unforgettable times that the ranch has to offer! Nothing is better than an interesting conversation and laugh with family/friends, old and new, while riding horseback over peaks and through streams on our thousands of miles of trails. Look up and take in the breathtaking views of the lush Plumas National Forest. Inhale the fresh scent of the pines and exhale your worries. Then it is time to refuel with a hearty, family-style Chuckhouse lunch and maybe find out some new fun facts about Mom or perhaps befriend a fellow Greenhorn sitting next to you. The afternoon is the perfect time to teach your daughter the fine art of pond fishing. Grab a rod and drop a line in the fully stocked pond. While you wait for the fish to bite, share a story or a laugh. If you’re lucky, you’ll catch dinner and a priceless smile. If not, no worries, you’ll have a fun memory. Competitive? Good. Nothing is better than the pride you will receive after beating your older brother in a bullfrog race in the Saloon. The first frog to cross the finish line wins! The only rule is no touching the frog. You can blow on them, pound the ground behind them, and kiss your rosy red lips to their little green butts to get ‘em moving! After a long day of riding, fishing, and bullfrog racing, it’s time to relax and cuddle up with your family on a blanket on the lawn and gaze up at the star filled sky or maybe sing along to your favorite country tune around the campfire.